This Guatemala rum is a spectacular blend of sweet and old rums aged 6 to 23 years. Simply amazing. The Solera ageing technique consists in blending rums of various ages and leave the blend to mature in a cascade of barrels: American Bourbon, Sherry and Pedro Ximenez wine. The rum obtained melds honey, caramel, spiced oak and dried fruits. A hand-braided palm leaf wraps the bottle, a touch of Guatemalan craftsmen. 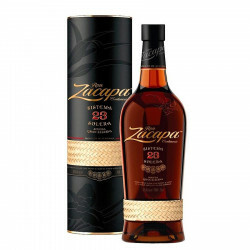 Zacapa is a small town northeast of Guatemala City. In 1976, the city celebrated its centenary and the largest rum producer in the country, the Industria Licorera Quetzalteca, created for the occasion Ron Zacapa Centenario, a truly unique premium spirit. Unlike other rums, Zacapa uses first press concentrated sugar cane juices, known as "virgin sugarcane honey" rather than molasses, which are residues obtained from sugarcane refining. This influences the taste of the final result. Using yeasts extracted from pineapple, the mash is slowly fermented before being distilled in a single column copper still. The rum obtained is then aged in cellars, 2300 meters above sea level, "the House above the clouds". This exceptional location intensifies the infusion of flavours from the barrels and enriches the taste of the final nectar. Nose: subtle notes of toasted oak. Hues of vanilla, cacao and pinneaple and caramelised bananas. Palate: less toasty, vanilla and perfectly balanced spices. 2008 - Silver Medal, San Francisco World Spirits Competition.